U2 but recently (probably since Christmas) and receiving my U2 Ipod I have been listening, reading and watching something U2 EVERYDAY! I just can't seem to get enough! I'm reading the book U2 by U2 and its made me love the band even more than I already did. As a schoolboy Bono was a troublemaker; the class clown of Mount Temple High School. Considered a "cool" kid who had a tendency to do weird things, Bono joined a group of kids known as "The Lypton Village". That is how he received the name "Bono Vox", after a hearing aid sold in a store in Dublin. 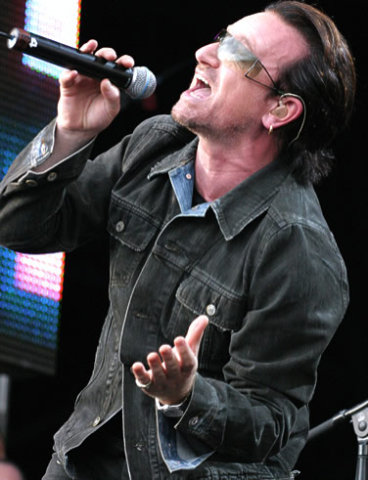 Bono hated his nickname at first, but then learned that "Bono Vox" meant "good voice" in Latin. Ironically, he was not given the name because of his singing voice -- which at the time he did not even have -- he was given the name because he was never calm.